In 2011, people around the world became transfixed by the events in Tahrir Square in Cairo. 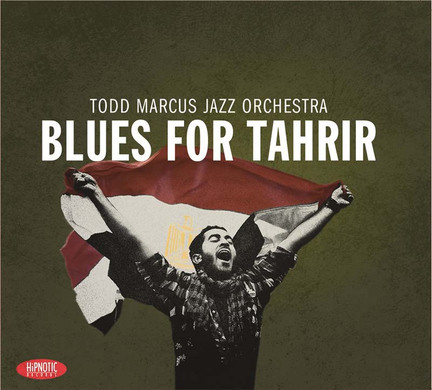 The cover of this album by bass clarinetist Todd Marcus depicts a young protester triumphantly waving an Egyptian flag. He, along with thousands of others in the square, had just learned that his efforts caused the brutal dictator (and American ally) Hosni Mubarak to resign. The fact that the Arab Spring has not turned out to be a simple victory for democracy does not detract from the courage of those in the square. They were all willing to die for freedom, and some of them did. It is personal for Marcus. His father was born in Egypt. His compositions and arrangements on Blues for Tahrir are deeply felt, sustained, detailed responses to a pivotal moment in contemporary history. From his small orchestra (nine to 11 pieces), Marcus derives dark colors and complex textures of emotion, including rage, exhilaration and mourning. “Tears on the Square” could be a funeral processional, its sadness carried in solemn ensemble voicings. In “Reflections,” Marcus is perhaps thinking of night on the square, the protesters huddled under makeshift canopies, not certain what violence morning might bring. Tenor saxophonist Gregory Tardy, trumpeter Alex Norris, trombonist Alan Ferber and vocalist Irene Jalenti create diverse compelling vignettes within the narrative. Marcus, based in Baltimore, is clearly what the jazz polls call a “rising star”-as a composer-arranger and as a bass clarinetist. His solos are highlights of this album. In Marcus’ hands, the bass clarinet is no longer a specialty instrument. Its unique timbral richness becomes incisive, fully capable of forceful expression. Therefore it is difficult to understand why his horn is recessed in the mix. This baffling engineering decision is a blemish on an album of serious purpose and exemplary execution.